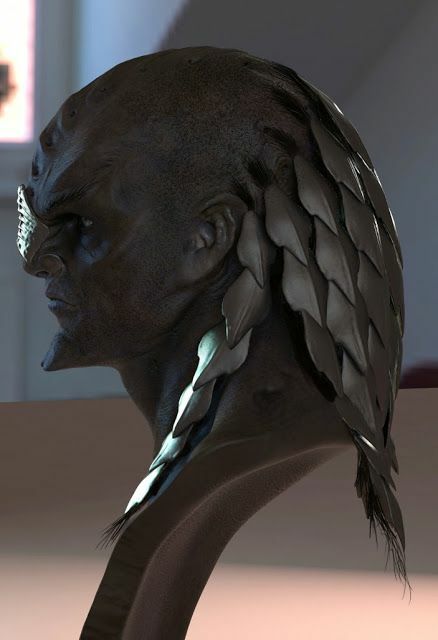 Apparently, the Klingons we see in Discovery are from a sect which completely removes all head hair as a way to honor Kahless' forging of the first bat'leth with a lock of his own hair. 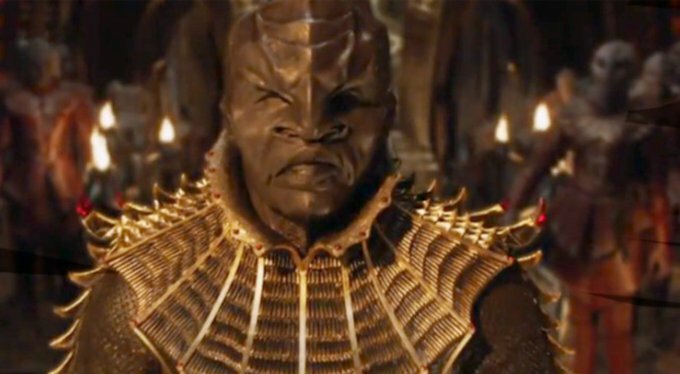 Re: An explanation for the Klingon appearance in "Discovery"
It's a pretty flimsy explanation. Kahless didn't cut off all his hair. And that just explains why they don't have hair, not why they look completely different. Actually, I was about to get to that. 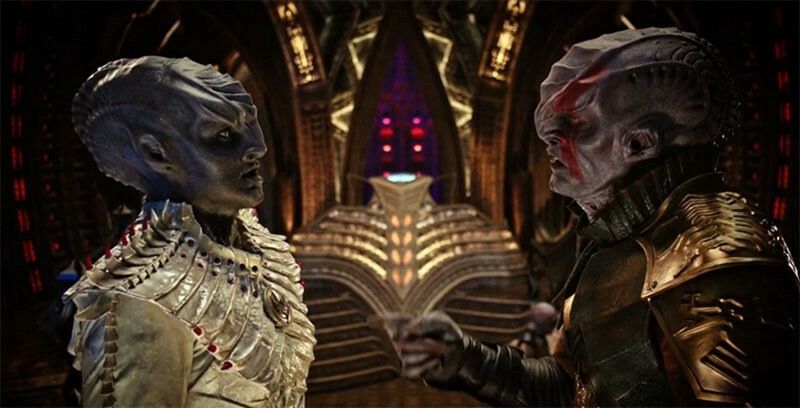 When looking at Memory Alpha, I found another quote basically stating that they're the descendants of Klingons who left Qo'noS a long time ago, who started to adapt physiologically to whatever planet they landed on, essentially becoming another subspecies of Klingon. Or.... the Klingon equivalent of abhumans from 40K. So basically, we have members of a new Klingon subspecies that ritualistically shave off all their hair. They aren't that different from TNG-era Klingons, minus the hair. 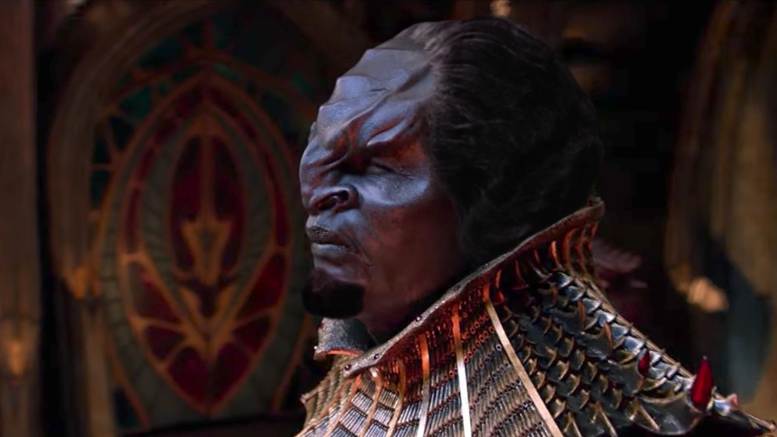 Lord knows there's dozens of pics of the Discovery Klingons with hair photoshopped onto them and they look fine. And I think it's great to finally see Klingons with different clothing styles for a change, instead of reusing the same old worn out TOS movie uniforms, and making them more like humans with different cultural styles. I have to disagree on the appearance. I don't think they look Klingon at all. You don't like Klingon soldiers wearing uniforms? That's kind of the thing about uniforms, they are supposed to look similar. We see ambassadors, scientists, lawyers, and renegades wearing different costumes, it's not like every single klingon wears the same thing. Do you think all the Starfleet officers wearing the same uniform is weird? Nope they do pretty much. As has been pointed out by many, many folks, the features on these Klingons are just the same as many TNG-era ones, just made a little more prominent. Adding the hair back in addresses the complaints. So again, this all makes sense and makes very good use over the cinematic large budgets being spent on each episode. Not to me. 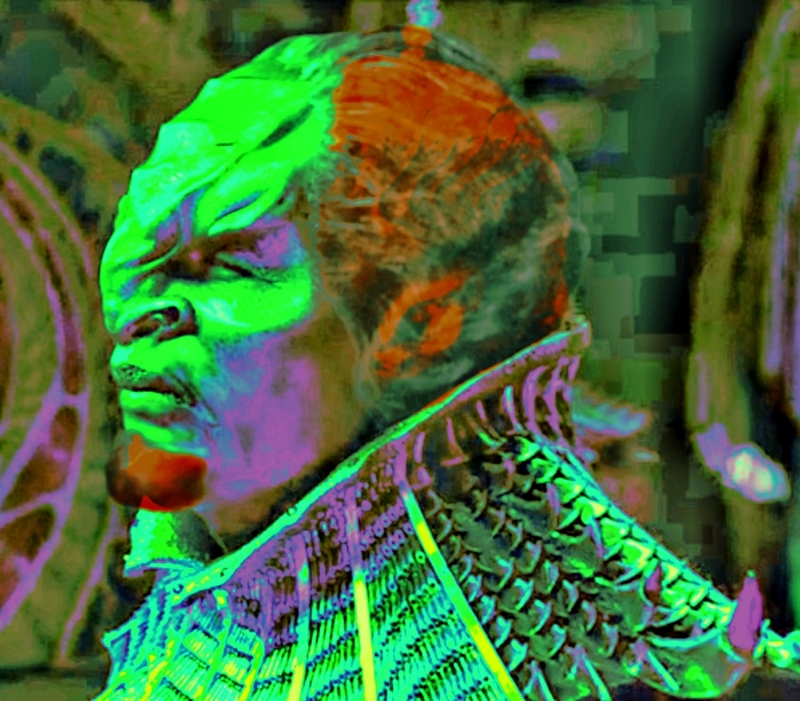 Maybe you can find a couple screenshots to modify that vaguely look Klingon to fool the average audience. That everyone would be going around in the exact same uniform year after year, for centuries is silly when we even see Starfleet change uniforms every few years. They still have to be recognizable as Klingon though, it's the same reason Starfleet is still using Mirandas in the 24th century. I'm not going to touch the main thrust of the argument, except to second Sideswipe's point that the beclawed quadri-nostrilled hairless elongated-skulled botox-lipped jagged-neck-ridged-pillow-ripping double-dicked over-toothed half-blind* quasi-race-caricatures that come in various shades of "bruise" are not launched back into normalcy merely because "hairless" was deleted. The main point I wanted to make is simply that these Klingons are *not* more expensive to make, especially when even the lips and neck are covered. There is more latex, sure, but the connective makeup is way, way faster and easier. The 3-D printed clothes look expensive, but unlike regular clothes where such detail would require individual sewn or glued additions, those are just "digital effort" and paint . . . no chainmail or leather or fabric difficulties. These Klingons are from the cheap seats. except to second Sideswipe's point that the beclawed quadri-nostrilled hairless elongated-skulled botox-lipped jagged-neck-ridged-pillow-ripping double-dicked over-toothed half-blind* quasi-race-caricatures that come in various shades of "bruise" are not launched back into normalcy merely because "hairless" was deleted. Damn right. Try turning this pic into Klingons by photoshopping some hair. Never really got around to responding to this, but that really doesn't make sense either. As of the Next Generation era the founding of the Klingon Empire was 1000 years before. These "Klingons" would have had to have left long before Kahless would have even forged his first bat'leth. There's more like this out there. If you have to completely remove portions of the head, thereby change the shape of the head itself your argument completely falls apart. The first picture with plated dreadlocks is from STID, not STD. The STID (JJ-Verse) Klingons didn't have the elongated skulls, though amusingly some of the concept art does basically have the Discovery Klingons, down to the quadri-nostrils. Note that the ones with elongated skull also have far bigger hair in the back. Additionally, the picture with T'Kuvma with Lando Calrissian hair only barely covers the rear of the skull. You'll note that the ears are generally at the midpoint between nasal bridgework and the new rear skull ridges. Proper Klingon hair would thus stick out rather further aft than most such pictures allow for, as they are trying to cheat the look back to normal. Actually, that brings to mind an old hypothesis of mine - that the Klingons shown in "Into Darkness" are hybrids of "normal" Klingons and "Discovery" ones. Especially since I remember reading somewhere else that later seasons of Discovery will show more "normal" Klingons alongside the new. Also, the shape of the heads could be explained by either A: ritualistic head-warping, like what the Maya used to do, or B: the presence of high levels of mutagens on whatever world they settled on. Maybe a combination thereof.